Adventures of a group of birds who teach children about social responsibility. It is Christmas Eve and Samuel, Rudy and Muffin find a lost little mouse. Browse content similar to Christmas Special: A Very Squooky Christmas. Check below for episodes and series from the same categories and more! Exciting! Oh, I love Christmas! Ah, Samuel, Muffin and Rudy. It's Christmas Eve. Oh! And you're just in time to decorate our tree. -You seem to have decorated yourself, Mr B.
and we have much to do before tomorrow. Beaky? Muffin open present now? No, Muffin! You have to wait until Christmas morning. I'm as excited as you are, Muffin. But Christmas is almost here. # Oh, can't you feel it All around? # The chill in the air And the snow on the ground? -You're right...but presents are pretty great too! A little less singing And more decoration! Hello? Is any birdie there? What sort of bird is that, Samuel? He's not a bird, Rudy. He's a mouse. -There's nothing to be afraid of, Muffin. # Out of the branches peeking? # What, what should we do with him? -Is that right? Are you lost? Do you know where your family is? We have to get him back home to his family. I absolutely agree, one hundred per cent. But Samuel, it's Christmas Eve. And tomorrow is Christmas morning. Rudy, Muffin - I'm afraid Christmas may have to wait. Little Squooky needs our help. Great! I knew I could rely on you two! But how are we ever going to find Squooky's family tonight? We'll ask the community for help. -the sooner we'll find them. Why, of course I'll help. A little to the right, Quinn. -Merry Christmas, hatchlings. What's the problem? # You're looking for white mice in the snow? We have every birdie looking for Squooky's family. -I suppose all we can do now is wait. Look! Muffin and Squooky play blocks. Don't worry, Squooky. Someone on 3rd and Bird will find your family. Quinn, Missy - did you find Squooky's family? We searched the lower branches twice But in the end we found no mice. Here comes Mrs Billingsley. I'll bet she found them. -Mrs Billingsley, did... did you find Squooky's family? But I did find a bit of cheese. I couldn't find Squooky's family. we can't give up. We have to keep trying. You're right, Samuel. I suppose we should check one more time. -is this such a bad place for Squooky to grow up? Do you mean Squooky could live on 3rd and Bird? # And Mouse I can see it now! # So what do you say? No, Rudy, it wouldn't be right for Squooky to live on 3rd and Bird. He deserves to be with his family. Samuel, where are you going? Just for a fly. I want to be alone with Squooky. I suppose I couldn't help you after all. No-one should be away from their family, not at Christmas. SAMUEL AND SQUOOKY: # Squoo-ook! Huh? Squooky, where are you going? Oh, you did it, Samuel! By the way, I say brilliant! Muffin glad Squooky find family. It's the best present a bird could ask for. Aw, Samuel, you're such a softy! # And socks for our toes! # What could be better Than either of those? 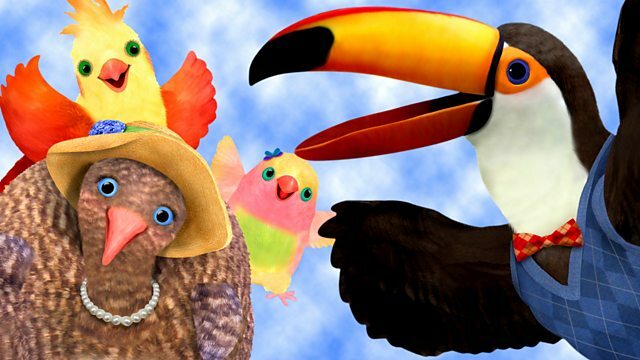 Colourful adventures of a group of birds who teach children about social responsibility. It is Christmas Eve and Samuel hears a strange sound coming from the tree. Samuel, Rudy and Muffin discover a little mouse that is frightened and lost. It will take the help of the entire community to find little Squooky's family before Christmas Day.